This diy has been a long time in the making. It popped into my head a few months ago and I kept putting it off….until now. I don’t know why I waited so long! 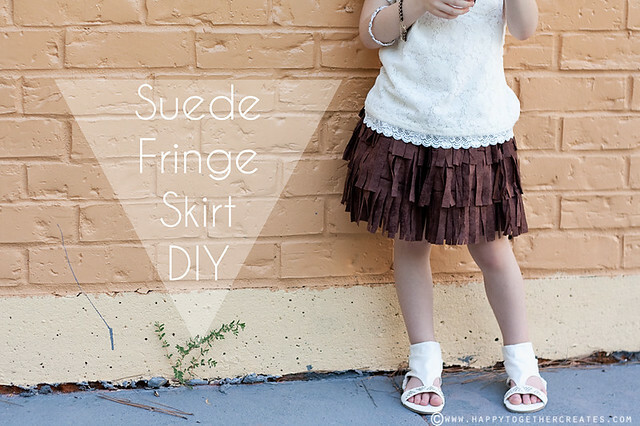 I know all things suede and fringe have been popular for a while now. But better late than never! 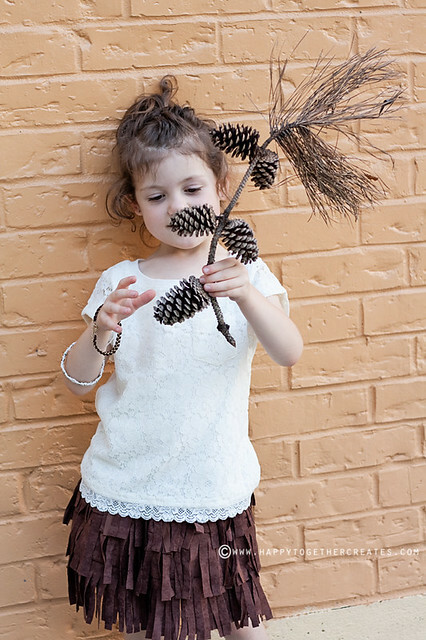 I adore how fun this little skirt is on my J.
I also adore how she turned our little photo shoot into a nature exploration. 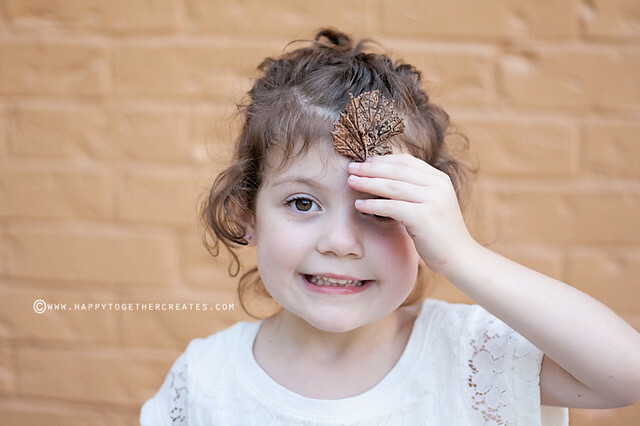 Oh the cuteness that she is! 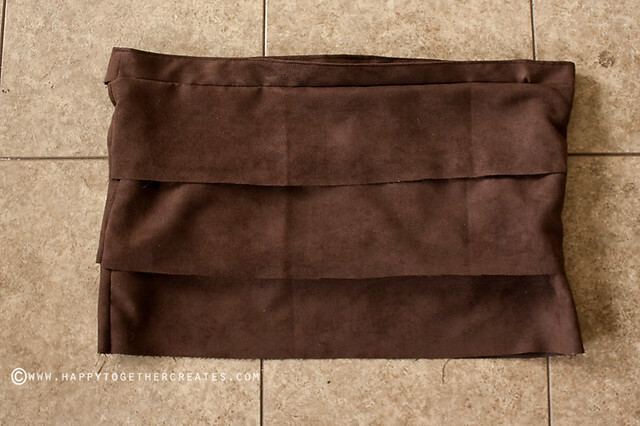 Ok. Now let’s get back to this skirt thing, the one that was suppose to be ready last week. Well, there’s a good reason for that. And above is that reason. 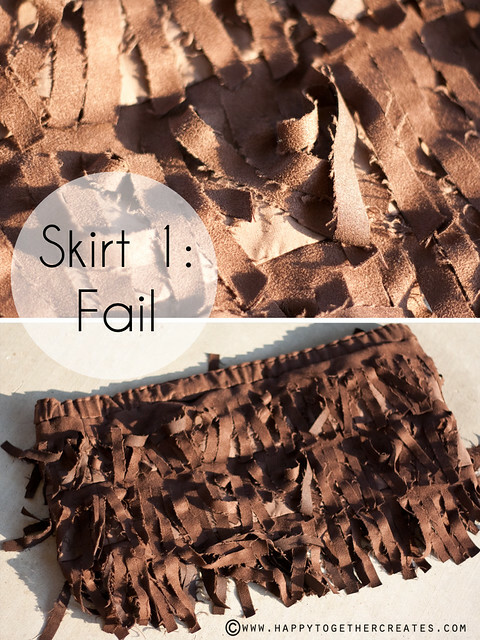 The first skirt I made was a fail. It was okay by construction standards, but the material taught me a lesson. 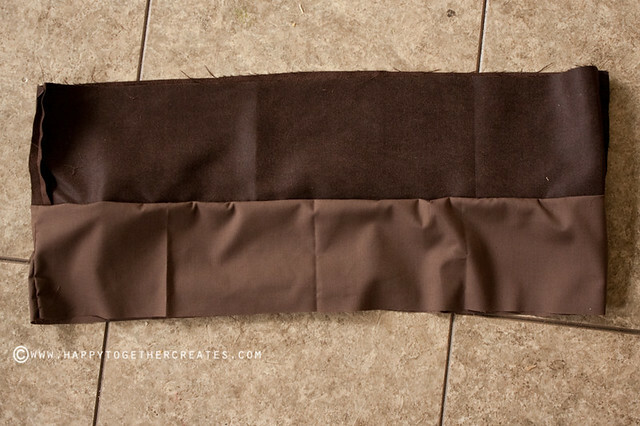 Apparently not all fabric labeled “suede” at the fabric store is true double sided suede. So, I put this thing in the dryer after spraying it with water (it was so full of static cling, I was trying to help it) and it came out all frayed. Which, really isn’t too bad looking, but not what I wanted. So I went to another fabric store and all I could find that was a different kind of suede fabric was this costume fabric suede. See how the back of it is different? It keeps it from fraying. Now, had I not had two whiny children with me at said time of looking for new suede fabric, I might have found the proper stuff. But at least I found something that worked. And it was on sale. Yay! Time to use some math skills now. -Determine the length you want it and then measure waist. 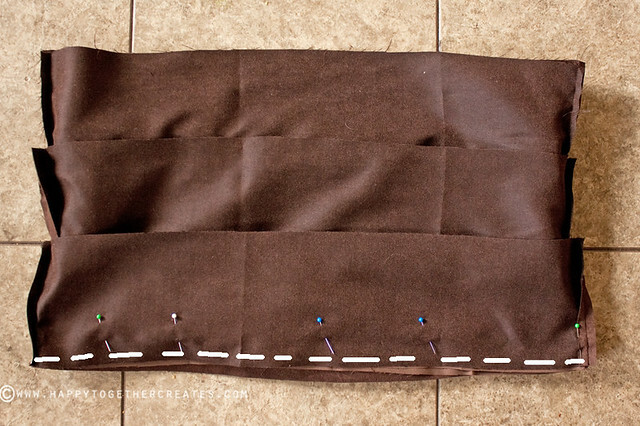 -To determine the width of all of the above pieces, you will need to just multiply the waist measurement by 2. -For the length of the rows, take your desired length and divide by 3. Now add at least .5″ for seam allowances. 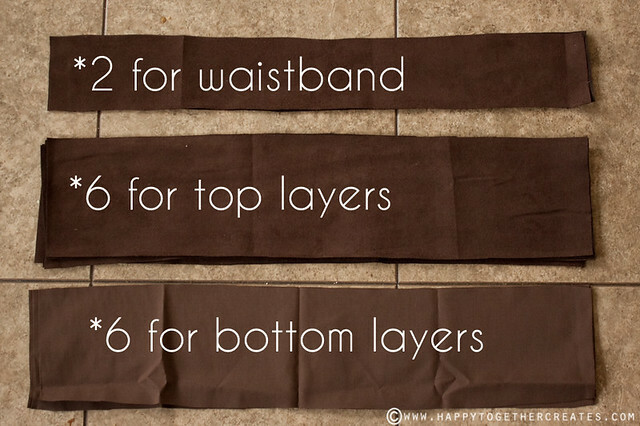 -The waist band will add an extra inch too at the very end. -You will need 6 pieces for the top layers. These will be longer so it overlaps. -You will need 6 pieces for the bottom layers too. 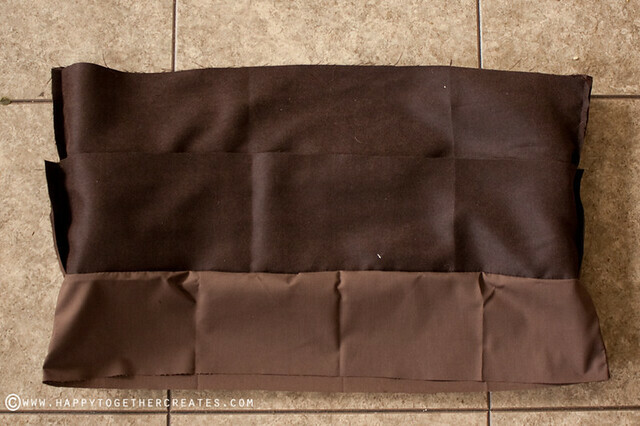 Now you will need to start sewing all of the layers together. 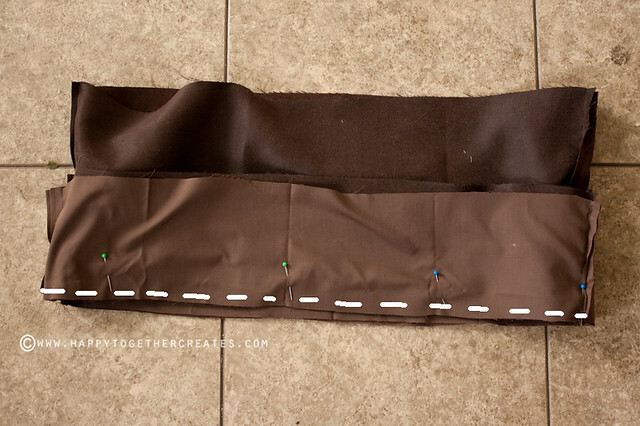 Start with the two waistband pieces and place together, right sides facing. 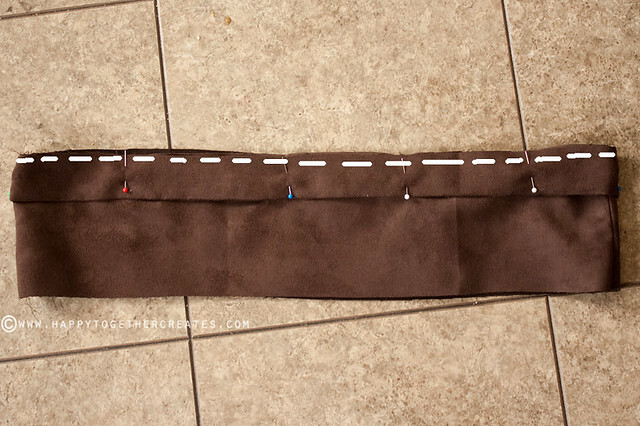 Sew down the length on each end. Then to this with all of the top layer pieces, creating 3 different pieces. And finish up with the bottom layer pieces, creating 3 different pieces. I suggest ironing open the seams as it makes it less bulking there when sewing. 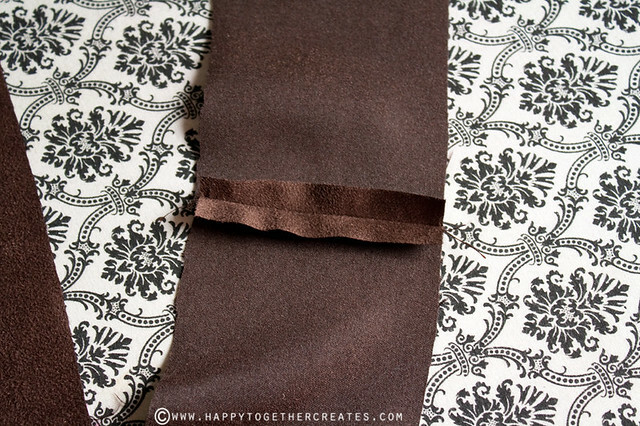 Take the waistband and fold in half, wrong sides facing. Iron if needed. 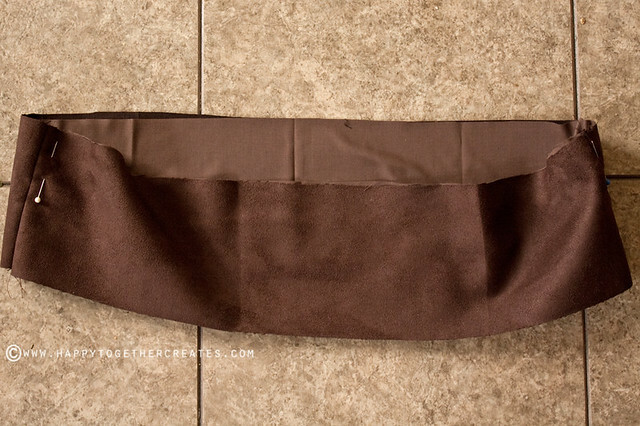 Now, I didn’t do this at this point the first time, but I suggest you do this now: At the top fold of the waistband, sew all the way around very close to the edge. It helps keep the elastic in place. Now we will start to put it together. Take on bottom layer and on top layer and place together. Both pieces right sides will be facing up. Pin on the side to help hold in place. Place the folded waistband on top so raw edges are meeting. Sew around making sure to leave about a 3″ opening to insert elastic in later. Now turn the waistband and top layer up so only the bottom layer shows. Put another top layer and bottom layer together, both right sides facing up like before. Now pin that onto this one exposed bottom layer. Sew together. Flip down the bottom layer. Again, put another top layer and bottom layer together, both right sides facing up like before. Now pin that onto this one exposed bottom layer. Sew together. If you turn all the layers down, it will look like this. 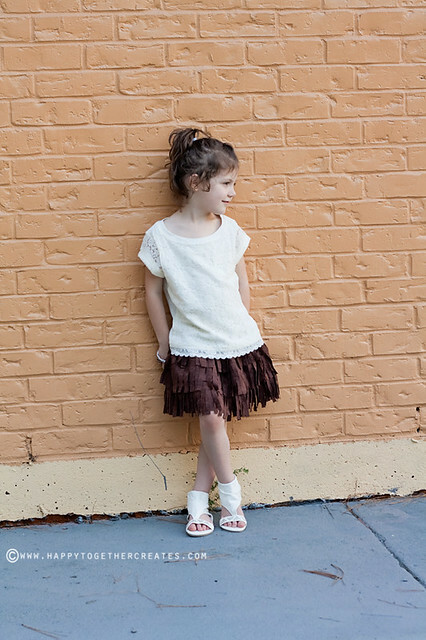 Now is a good time to cut all of your fringe. On the bottom layers, cut through both pieces. 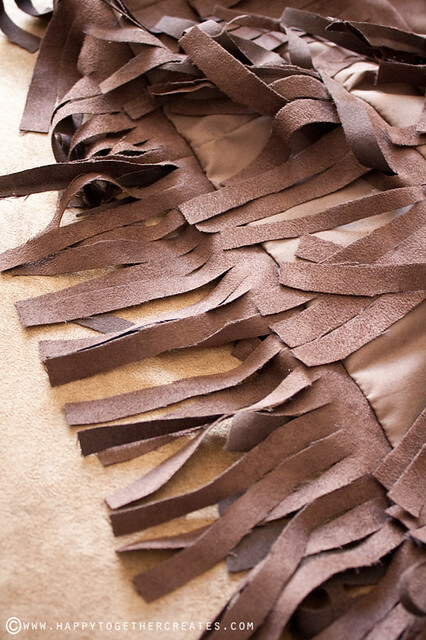 It creates a thicker fringe on the bottom and looks a lot better. 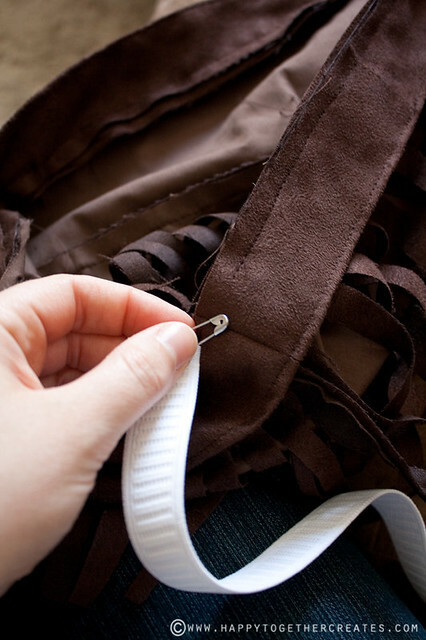 Once you have cut all three tiers, take your elastic and put a safety pin on the end. 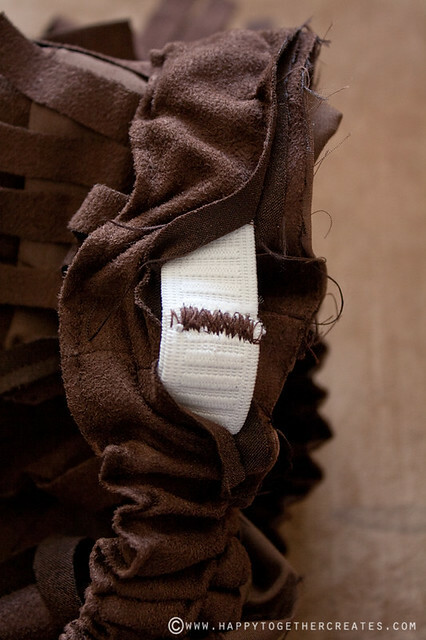 Push it into the opening on the waistband and pull elastic through the casing until it reaches the opening again. 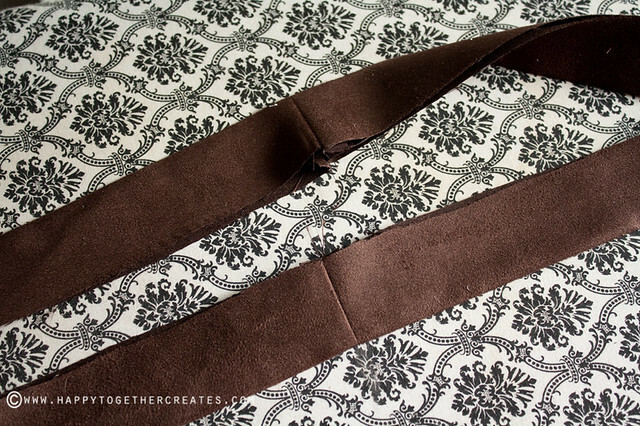 Then sew the elastic together (I just lay one side on top of the other, making sure none of the elastic is twisted in the waistband). Push elastic end and sew opening shut. 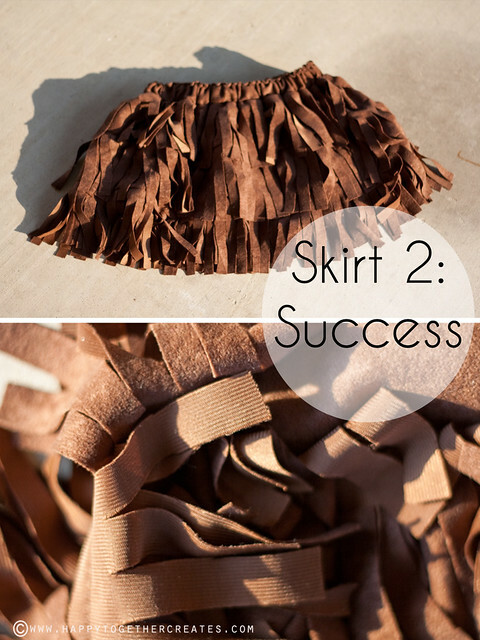 Make sure you are also sewing it onto the skirt at the same time as it wasn’t sewn together earlier. 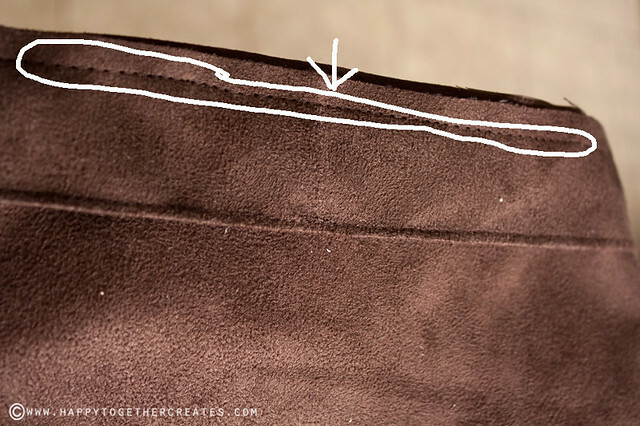 Another tip I have is to sew the elastic down in two places (I do it on the side seams). Just stretch it to make sure it’s even when doing this. 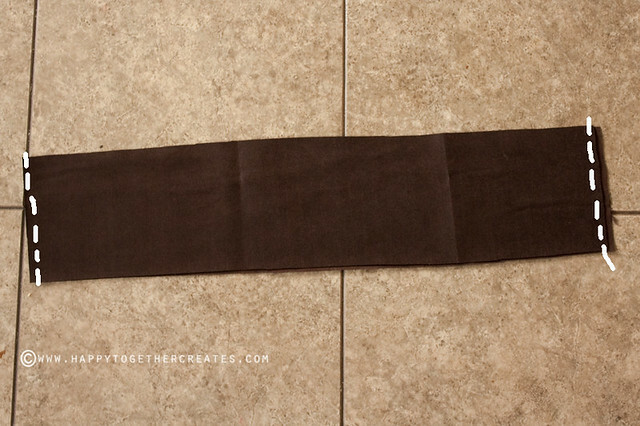 It will prevent the elastic from twisting and it keeps the fabric even in the front and the back. I’m so glad I finished this up and was able to share! Enjoy! I love this, Jess!! I haven’t seem anything like it before, either. Great idea. And thanks for giving up (like I would have, haha) the first time! Thank you so much for this post. I want to let you know that I posted a link to your blog in Creative Busy Bee Craft Inspirations, under the Page 3 post on Sep. 25, 2012. Thanks again. omg, it looks amazing, thenks for tutorial! 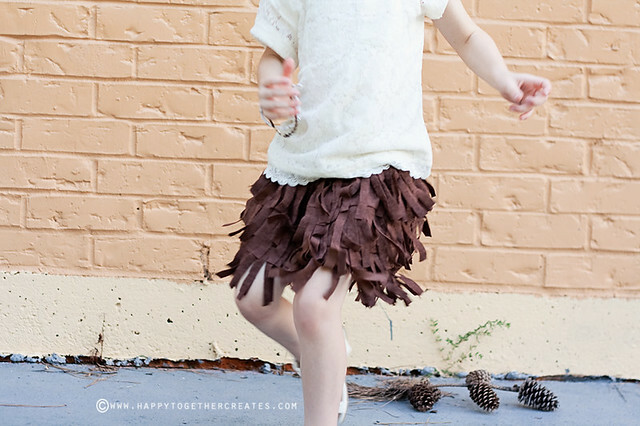 Is there a right or wrong way to cut fabric so the fringes won’t unravel ? Or special scissors? 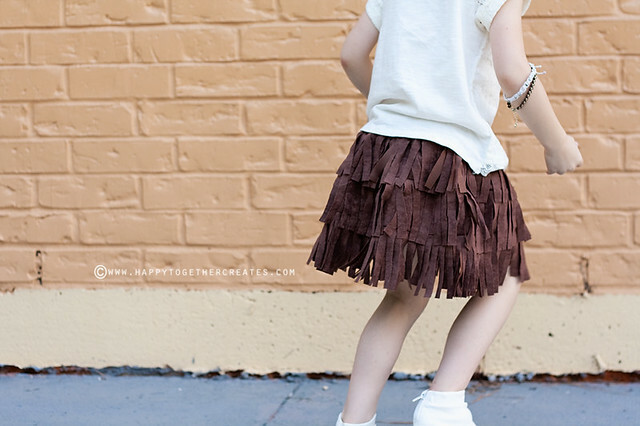 Like in the 1st skirt you made. I made a vest that looks accactly like the mess u made with the 1st skirt. Help!! I guess you could try cutting on the bias, but I found that finding the fabric with the right type of “backing” worked like a charm. Some of them are just woven on the back making it unravel. I’m sorry it got all messed up for you as well. I hope you are able to make something work out.